HAD a taste of the notorious São Paulo traffic jams on Wednesday, June the 11th. It was the second and final day of the 64th FIFA Congress (10 and 11 June) and Kunle Solaja and I decided to get a first hand glimpse of what to expect in the immediate and, probably, the short and long term future of world football. The FIFA Congress is the supreme legislative body of the world soccer ruling body and it is normal practice to hold its congress on the eve of a World Cup opening ceremony. The talking point amongst delegates in São Paulo was President Joseph Sepp Blatter’s impending decision to run for yet another four-year term in office at the next elective congress. The item was not on the agenda this year, but the delegates got the message all the same. “There’s no age limit and no tenure limit in football administration,” Nigeria Football Federation (NFF) Vice President Chief Mike Umeh who stood in for President Aminu Maigari told Solaja after the FIFA Congress came to a close. That, obviously, is the message that Umeh will deliver to delegates at the NFF’s own elective congress in August this year. But this narration is not about football politics. I was about to share with you a day of one of the biggest vehicular and human traffic jams that I had ever experienced in my life. The lady receptionist at the front desk of Santana Gold hotel had assured us that Transamerica Expo Centre, venue of the FIFA Congress, was just “20 to 30 minutes from here.” It was either she was also new in São Paulo or she completely under-estimated the morning traffic. We made the journey in nearly two hours! Ten-lane “free-ways” as they call them in the US (we call them “express ways” in Nigeria) are a common sight in São Paulo. The roads are smooth and smart but you are lucky if you get to do 30 kilometres per hour at any stretch this particular morning. As our taxi driver crawled along in the dense traffic, my eyes kept darting to the digital meter on his dashboard ticking slowly but steadily, and eating away all the Reais in our pockets. The Reais is the local Brazillian currency and it exchanges for One US Dollar at 2.17. I leave you to do the conversion to Naira. The 116 Reais that we clocked on arrival at Transamerica did not pose a problem, but the time spent in traffic was an experience. Huge articulated trucks, mini vans and small cars jostled for space but, remarkably, the drivers were very orderly as most kept in their lane rather jump all over the place. The bright side of the taxi ride was that it afforded us an opportunity to take in the sights of downtown São Paulo. Magnificent architectural beauties dominated the landscape. Brazil may be grouped alongside Nigeria as an “emerging economy” but, on the strength of what I have seen of the São Paulo road network, Brazil is way ahead of Nigeria in transportation infrastructure. That conclusion was reinforced during our return journey from Transamerica. Kunle and I had planned to proceed to the stadium to collect our media tickets for the opening match between Brazil and Croatia but, having spent nearly the whole day at the FIFA Congress, the only place on our tired minds was home. Or, more appropriately, the Santana Gold hotel. This time, we decided to use the São Paulo metro, having noticed how the trains sped past us on their tracks while our taxi was stuck on the busy roads in the morning. Our only motive was to avoid the congested roads, but we ended up also saving a ton of money. 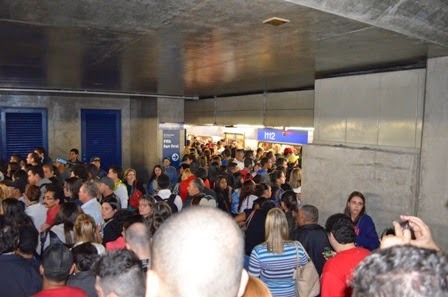 I was completely shocked when the ticket officer at Santa Amaro station demanded for Six Reais for two tickets for our return journey to Santana station. Only six Reais for a trip that had cost us 116 Reais by taxi in the morning? Unbelievable. We had not thought anything about paying the taxi driver. But in retrospect, we started feeling that we had been properly robbed. Yet, another great experience awaited us. It is hard to come across people who understood or spoke English language in Brazil where Portuguese is the national language. Even at Santana Gold, only one or two of the receptionists spoke passable English. But on this day which was gradually turning into night, an angel named Andre descended from the heavens to guide us home. Thanks to Andre, a glasses-wearing student of ESPM University of Technology, we were able to negotiate the busy São Paulo metro. Andre spoke impeccable English and led us by the hand as we changed from one metro line to the other. Left by ourselves, we would most likely have missed our way at some of the very busy change-overs. It was Lucas who took us through our most scary experience at our penultimate stop in Luz station. We suddenly came to a complete halt as the mass of humanity ahead of us stopped moving. The trains had not arrived, the platforms in both directions were jam-packed and people stood “bumper-to-bumper” and up the stairways in the metro underground. The only place I had seen such a mass of humanity stuck to tightly together was during my Pilgrimage to Mecca. When the trains arrived at five to ten minute intervals, people had to force themselves in, in bits and pieces because the train coaches already had full loads of passengers and only a few we’re dropping off. It took us about 30 minutes before we could get on a train and, even then, we had to stand still inside; no bending down, no scratching of the body. The scenario brought to mind Fela’s classic hit, “Shuffering and Smiling.” But this night in São Paulo, Brazilians were not smiling at all. Compared with Oshodi and the overloaded Molue buses and passenger trains, the only difference is that Brazilians are not seating on top of moving train coaches in São Paulo. Massive vehicular traffic jam on the road in the morning, followed by a crushing human traffic jam in the metro in the evening. It’s been another unforgettable day for me in São Paulo, a city of 11 million people.